My father, James Claude Patterson Jr., died on April 26, 2010 — almost exactly one year ago. He was just shy of 83 years old. Dad was a retired NASA engineer who worked for the government space agency for 35 years. (It was known as NACA when he started there.) He was an aeronautical engineer heavily focused on eliminating the induced drag that is wingtip vortex. He was involved in a number of high profile projects such as the X-15 experimental rocket plane, the supersonic transport (SST), the Whitcomb winglet, and the Wingtip Vortex Turbine. After retiring from NASA, he continued his research for a number of years at NASA research firm ViGYAN, Inc. Shortly before he died, he was invited back to NASA for a series of interviews about his life’s work. I wanted to share a bit of this. The video that follows is a short clip of my father discussing wingtip vortex. Have a look. Other videos can be found here. In 2005 my father wanted to share some of his basic thoughts about wingtip vortex flow with a few of his post-NASA contacts, and I helped put his handwritten copy and sketches together into a digital document. 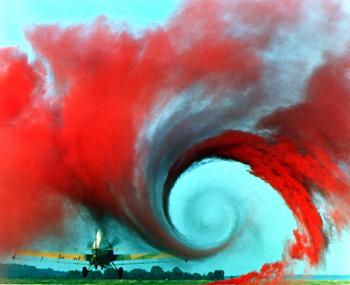 Those interested can have a look at The Nature of the Wingtip Vortex Flow by James Claude Patterson. Shortly after his death, I posted a Flickr photoset of images of and around him. Those interested can have a look. I miss you, dad. Thanks for the science — and everything else. UPDATE: NASA has, since, placed a nice profile of my father online, under their Langley Legacies historical project. It was very nice to discover this. This entry was posted in Just Rambling, Uncategorized and tagged drag, induced, NASA, science, turbine, vortex, wingtip. Bookmark the permalink. as an engineer myself and son of an engineer, I find all interviews with “engineering old timers” so inspiring. The problems were (as they still are) very complex, but tools they had look to me so primitive… (not the computing or calculating power we have today). I think their ability to rationalize and understand the problems were in fact much better that ours is today. I am so sorry for your loss …. He seems like such a fantastic person — a commodity far lacking …. He had quite a career. Thank you for the interesting post. Your father was a true hero. Thanks for posting, Blake……I don’t have to tell you how much I loved and respected Uncle Claude. The best experience of my life was when I went to visit him in ’09, and we just hung out and talked for 2 and half days. Really miss him!!! My heartfelt condolences for your loss. From whatever I’ve read, he truly seems like an inspiring man, who I would have loved to meet. I’m very sorry for your loss once again, but I’m sure he must be soaring high above enjoying the physics of the skies, looking down on you and your family with a smile. Trevor, thank you for your interest in my father and his work. I am quite glad you appreciated his paper, and I know he would be, as well. Please feel free to cite or use excerpts or what have you. Again, I appreciate your comment, here.